Fast and reliable mid-volume monochrome printing with color scanning. Save valuable floor space with the compact form factor. Experience instant productivity with zero warm-up time, effortless roll changing, and a powerful on-board PC controller. Powerful Processing: The new family of PlotWave systems are powered by the new POWERsync PC Controller. It includes a Dual-Core G1620 @2.7GHz processor, 500 GB hard drive, 4 GB DDR3 RAM, and it runs on an embedded version of Windows 8 64-bit. Requires no-warm up time: With Océ patented Radiant Fusion Technology, the PlotWave system requires virtually no warm-up time, making it the fastest printer in its class. Includes integrated color scanning: Océ Scanner Express adds color scanning functionality to the innovative Océ print engine. Now you can scan markups and annotations and recall the files with full color integrity. Is rooted in green technology: The PlotWave 450/550 only heats up when printing, when in idle mode, it is cold and consumes almost no energy. 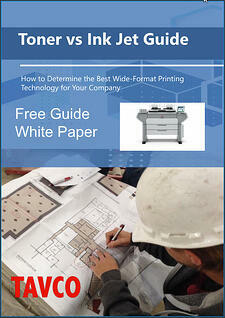 Durable and long-lasting: Robust technology is built to withstand workload of multiple users. 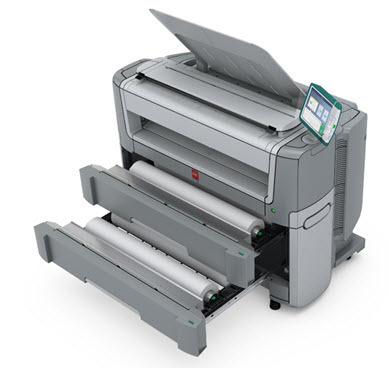 Wide-format printing, copying and scanning just got easier for everyone!